Additional Info: I graduated with a BA (Hons) in Music at Reading University and also hold a PGCE qualification and diplomas ARCO, LRSM and ALCM. 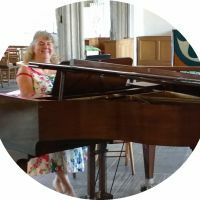 I do accompaniment work for choirs, solo singers and instrumentalists, as well as ensemble, orchestral and continuo playing on piano/organ/harpsichord. I am happy to play most styles as required. I have a Roland electric harpsichord, which with assistance can be taken to a performance venue. I am based in the southwest but able to travel as required.